Brick breaking, or Breakout clones, are a subclass of the bat-and-ball genre. This corner of the gaming industry is named for the mechanic of the player controlling a block, or bat, which hits a ball towards another player's bat (like Pong) or different objects such as colored bricks. These games are an excellent way to kill time or keep the little ones entertained. And they've been making a serious comeback on mobile devices. Phones and tablets are a great platform for this game genre, due to their screen size, processing power, and instant accessibility. And Android devices specifically have seen a significant rise in these sorts of apps becoming available on the Google Play Store. But with so many to choose from, how can you know which ones are worth your time? Never fear -- we've done the research for you and uncovered the five best brick-breaking games for Android. This brick breaking game from Gram Games turns you into a mage facing an onslaught of fantastical beasts. Foes will lose health with each strike of your magic as you protect your town and fight back. Defeat them all before they reach you, or it’s lights out! Gain rewards like diamonds and gold after each successful hold and use those to strengthen yourself and your skills. The stronger you and your defenses get, the more likely you are to succeed. 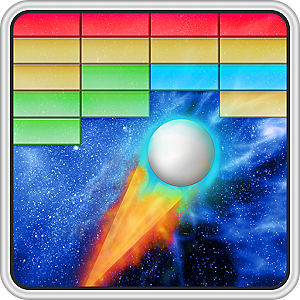 One More Brick is an addictive little app by Rifter Games. This unique mash up of brick breaker and bubble shooter comes with some nice features. Take your time to aim and watch the ensuing chain of balls hit, bounce, and annihilate the bricks. Want to make your ball look unique? No problem -- you can customize your ball in the Balls Editor. Unable to connect to the net? You can play offline! 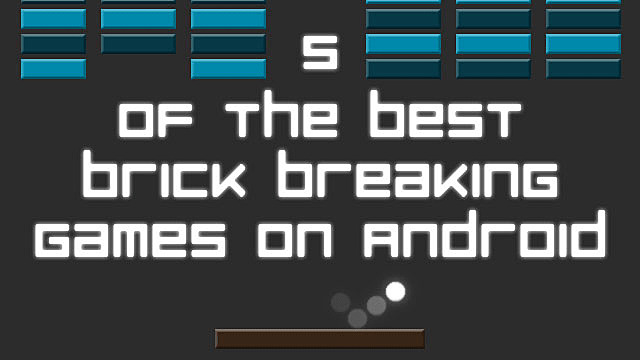 Break Bricks by CanadaDroid brings familiar gameplay with fresh challenges and unanticipated obstacles to the Android. It’s your job to destroy all the bricks with skillful use of the paddle below and ricochets of the ball. And every 30 levels, there’s a boss in the form of difficult shapes such as a temple or a dino! There are two different modes -- Arcade and Endless -- and over 150+ challenging levels to complete! So you won't run out of things to do anytime soon. 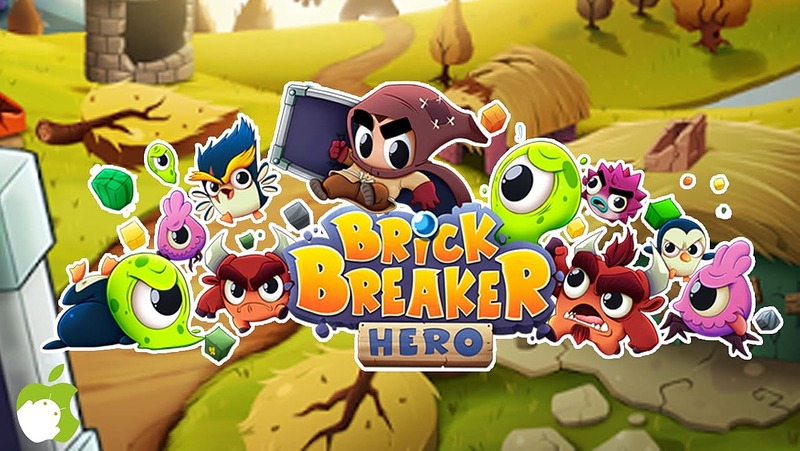 Developer Game Circus LLC takes the classic brick breaker game and gives it a new twist iwht Brick Breaker Hero. It’s up to you to break the captured villagers out of the monsters’ stronghold and be their hero! 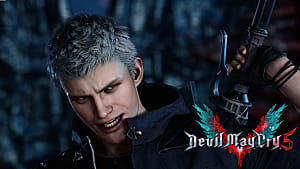 There are over 200 fun and challenging levels, a multitude of spells with spectacular effects that can aid you in your quest, plus boss and mini-boss fights, each with a new mechanic to overcome. Try out this fun and colorful game and see how far you make it. Smash by Magma Mobile remains true to its brick breaker roots while also adding new bonuses and options. You have the choice between 2 different modes, Arcade and Challenge. Arcade Mode allows for you to continually strive to beat your best score, while Challenge mode lets you progress through the packs and levels at your own pace. 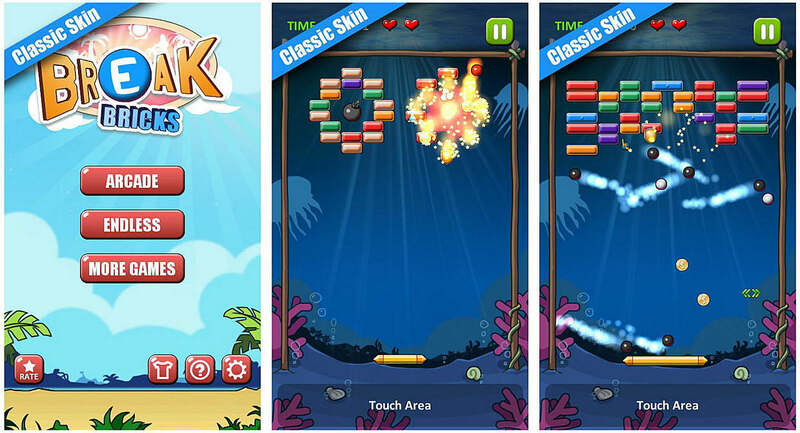 Brick breaker games are a blast from the past and a great way to kill time. Give the ones listed here a try or take a look through the Google Play Store and see what others pique your interest. You’ll find a wide variety of different brick breakers from mobile game developers from all over the planet. Have you already played these games? Know of another brick breaker you deserves a spot on this list? Let us know down in the comments below!